One of the most exciting choices for homeowners renovating or building a new kitchen comes in the choice of a very wide range of cabinet materials, colours and finishes. Like all interiors, the kitchen is one area in particular where trends are at play. With our fingers firmly on the pulse of what is popular when it comes to kitchens and cabinetry, the Adina Designed Interiors team explain what’s making waves in the world of kitchens in 2014. Creating a more streamline look creates a minimalistic style of kitchen. Floor to ceiling cabinets using a feature laminate such as timber grain or timber veneer can give the impression that cabinets are in fact a feature wall. 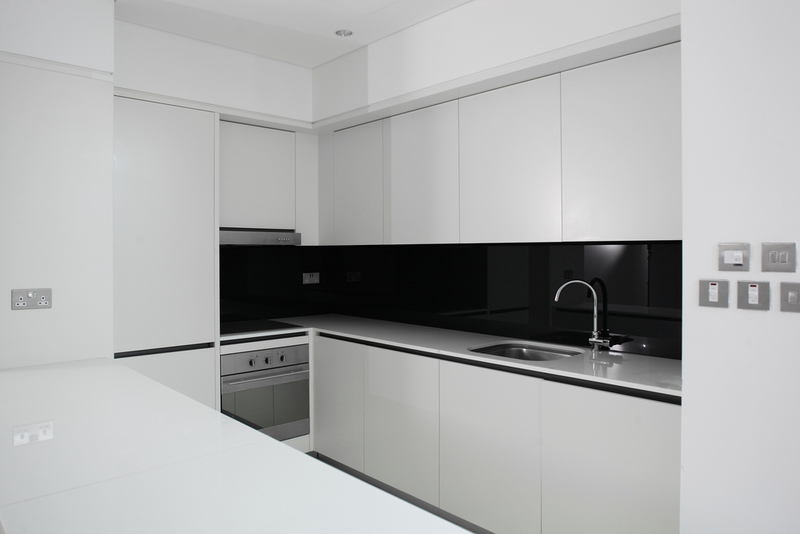 This style of cabinet can be enhanced with the use of integrated handles to create a seamless look. The use of these cabinets also maximises cabinet space. The use of LED lighting in a kitchen is becoming increasingly popular. This type of lighting can be used along bulkheads or pelmets, in overhead cabinets with glass or acrylic inserts, under overhead cabinets, as a feature strip around the bench top, in drawers as they open, and under base cabinets. While they are a feature in themselves, they are a very economical form of lighting that is often used as soft mood lighting when the kitchen is not in use. Concealing toasters, sandwich presses, kettles and mixers behind doors or in dedicated ‘appliance garages’ makes them more easily accessible and more likely to be used. There are a number of different cabinet solutions suitable for this purpose. The traditional Appliance Cupboard uses a tambour door that is easy to open and close. These can be made from the same laminate that is used elsewhere in the kitchen, or there are other materials being introduced regularly to give these cabinets a more contemporary look. Other appliance storage areas are concealed with the use of a bi-fold cabinet door or vertical sliding door. Again, these styles of doors are available in a variety of different finishes to compliment the overall kitchen design and can either blend in to the design or be a feature. Butler Pantries and Sculleries are ideal for busy families or families who do a lot of entertaining. Having an area separate to the kitchen allows appliances that are used often to be easily accessible and ready to use. It allows children access to the pantry without having to walk through the kitchen. Open shelving for the storage of commonly used pantry items makes preparation quick and easy. Having the additional bench space and sometimes an additional sink provides another preparation area when entertaining that is out of view – leaving the main kitchen area neat and tidy. This entry was posted in Advice and Infomation, Tips for Designing a Kitchen by admin. Bookmark the permalink.